I think the change is finally going to happen. Saw a blurb today somewhere with Demoff talking about throwbacks (blue and white) and a permanent change (blue and yellow). Point of this post is most of the photos accompanying articles, (regardless of where they are), ando n the website seem to be showing the Rams in the blue and yellow uniforms. It's gonna be great when we appear at the SB in Santa Clare in the '99 unis. I got the idea from the story that the uniforms may or may not go back to the blue and yellow - that it might be something new, but integrate historical colors in the scheme. As always, there are a few who think it's an omen that the Rams will move...even though it was never mentioned or even hinted at. I know this has been addressed, but.... It looks there is a good chance blue/yellow will be primary uniforms and blue and white will be throwbacks! That's awesome if this is actually going to be true. No matter what we will have uniform overhaul soon, Demoff says. The Rams have used various shades of yellow or gold for most of the franchise's existence, dating back to the team's Cleveland-based days in the late 1930s. 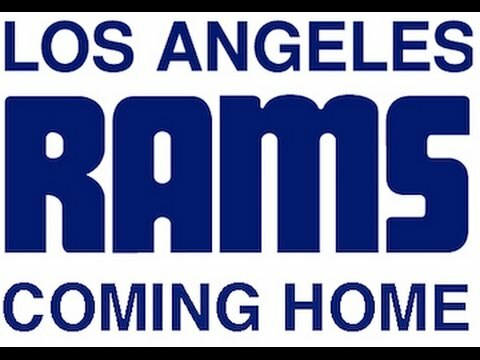 But there was a nine-season window during the Rams' stint in Los Angeles, from 1964 through 1972, when the team's color scheme was much simpler:blue and white. And that look may be coming back. DEMOFF TWEET: "A ton of votes for blue and white throwbacks. I'm with you on that and we are working on that as an option long-term." The Rams are known to be considering a uniform overhaul. In August, Demoff said he expected the team to revamp its look "at some time in the next five years." Judging by his tweets Wednesday night, that process is currently in motion. The Rams' last full-scale uniform redesign was in 2000 -- the season after their victory over the Titans in Super Bowl XXXIV. That redesign established navy and gold as the team's primary colors. The preceding uniform design, featuring royal blue and yellow, has been worn as a throwback since 2009. I could live without the gold. Wonder if that's silver and blue, or just the way the graphics read. I'm know I'm in the vast minority on this (maybe even alone), but I think the navy/gold is so much better than the royal/yellow. I'm fine with either the navy/gold or royal/yellow but hate the all white or all blue. Also hate the white pants. The white and blue throw backs would be cool. If you noticed the Rams changed the endzone colors last year to white and blue. I really like the current uniforms. Has a nice modern look in my opinion. im not against a redesign but i do prefer the gold over the yellow, mind you i only started watching them after the switch. i do like the current design but i hate the nike collar. I actually like the Navy and Gold better than Yellow and blue, yes, I'm new school. Would love the Navy/Gold like others have stated but I would be really happy to see the throwbacks the old Blue/White combo. Sorry, but bright yellow is definitely not a masculine color. It looks terrible on men. As a fan, I could not stand to wear those garish, bright colors. The current colors are fine...but the classic navy and white is what they should be wearing. How can you not love the '66 to '72 blue and white's as a throwback uniform? I hope they keep at least some gold in their uniform if they decide to make a change. I really liked the all gold pants. I wish they would bring them back. White is the color of purity. Wearing white is also is a deceptive way to fool the brain into believing something is what it’s not. White players appear to run faster and look thinner, just as players wearing all dark colors appear bigger and slower. On Thursday night the RAMS will suit up in their white away jerseys and wear their white pants, white shoes and white gloves. 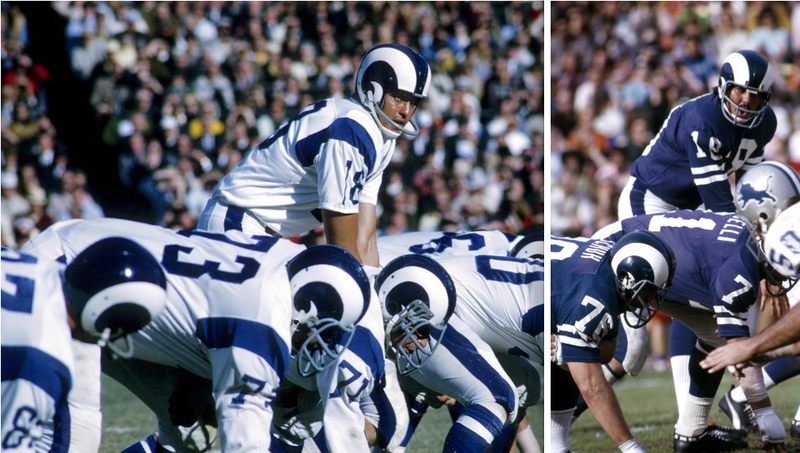 Due to an NFL ruling, the Rams are not barred from wearing their white horned helmets from the 60's and 70's. If we see them is anyone’s guess. If you’re going to the game make sure you wear your white Jerseys or a white shirt to show support. The NFL finally listened to the fans and will allow the Rams to wear the Blue and yellow uniforms for 5 home games this season. They'll wear the yellow "color rush" uniforms in Mexico, and the ugly white/gold/blue uniforms on the road and during the first two home games as well as the preseason. No more navy blue and gold jerseys. It was reported that the Rams sent all the letters and complaints directly to the NFL and said something like; "see what we're dealing with here? ", "this is what the paying fans want". Small victory, but a victory nonetheless. The Rams will introduce the new designs in 2020 when the stadium opens. Now is we can just find a way to sign AD.